Cluster extreme event (CEE), which is characterized by large affected area and long duration of extreme weather, has been arousing the worldwide serious concerns due to its severe impact on society. 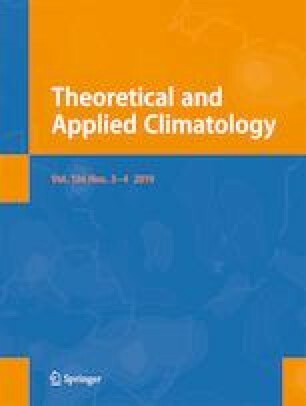 The winter cluster extreme events of low temperature (LT_CEEs) in the northern hemisphere from 1979 to 2013 are identified with a simplified objective method based on ERA-Interim and JRA-25 daily minimum surface air temperature. The probability density function (PDF) distributions of most indices in the winter LT_CEEs derived from the two datasets are well consistent with each other, especially in the occurrence frequency, duration, and affected area. As expected, the downward trend of all indices in recent 35 years under global warming is congruously revealed from both reanalysis. Nevertheless, the various indices of the winter LT_CEEs after 1998 are generally stable accompanied with slight upward trend, which might be closely related to the speed slowdown of global warming but require further investigation. Similar analysis was carried out with the simulated results of BCC_CSM1.1 model under four scenarios of RCP2.6, RCP4.5, RCP6.0, and RCP8.5. The occurrence frequency of the winter LT_CEEs under RCP2.6 remains stable after 2050, but significantly decreases under RCP4.5 and RCP6.0, and disappears under RCP8.5 scenario. Overall, the descent rate of the winter LT_CEEs accelerates with the emission rise. The ERA-Interim dataset is downloaded from the website of the European Centre for Medium-Range Weather Forecast (ECMWF); the JRA dataset is from Japan Meteorological Agency, and the BCC output is from National Climate Center of China. Thank all the data providers. We also thank the editor and the anonymous reviewers for their helpful suggestions for improving our manuscript. This work is jointly supported by the National Key R&D Program of China under Grant Nos. 2016YFA0600504, 2017YFA0603803, and 2016YFA0600701 and the National Natural Science Foundation of China under Grants Nos. 41775073 and 41575071.